The sudden, shocking realization that this entire blogging project is an attempt to understand Christmas Day 1985. Biograph, the five-album Bob Dylan retrospective, was released on November 7, 1985. I was sixteen years old when I received it on Christmas day that year from my parents. I also received a stereo – one of those all-in-one things that were mostly plastic but which incorporated a turntable, two cassette decks (dubbing!) and a radio tuner, and external speakers. I no longer had to listen to music on the family turntable, which was one of those huge wooden cabinet things from the 1970s in the living room. Freedom! We celebrated Christmas in Montreal that year, with my father’s parents. I remember the genuine joy of receiving that stereo (completely unexpected) and Biograph (somewhat expected, I’m sure I would have asked for it – I wanted it but it was expensive-ish for a teenager with no job). I remember assembling the stereo after lunch (well, plugging in the two speakers – not much assembling) and unwrapping and listening to Biograph for three and a half hours while reading the two booklets, one a well-illustrated biography of Dylan and the other a series of reminiscences on the songs via interviews with Dylan conducted by Cameron Crowe (who was still a few years from becoming the filmmaker of Say Anything…). This was a feast for someone like me, who was only somewhat aware of the hits. I am certain that Christmas Day 1985 was the first time I heard “Lay Lady Lay”, “Baby, Let Me Follow You Down”, “If Not For You” and dozens and dozens of other songs. Indeed, so unaware was I of Dylan’s career that the distinction between released and unreleased songs (18 of the 53 tracks on Biograph were previously unreleased) made no sense to me. I wasn’t hearing familiar songs with some new material – it was almost all new to me. Since I listened to this album hundreds of times in the next couple of years there are still unreleased songs from Biograph that I am shocked to not find on his early albums (“Percy’s Song”, for example, is not on Freewheelin’? That doesn’t make sense to me in 2014. Isn’t it one of the best songs on that album?). There are dozens (well, a dozen and a half) examples just like that. Live versions of things like “Isis” that are far more familiar to me than the album versions ever will be. 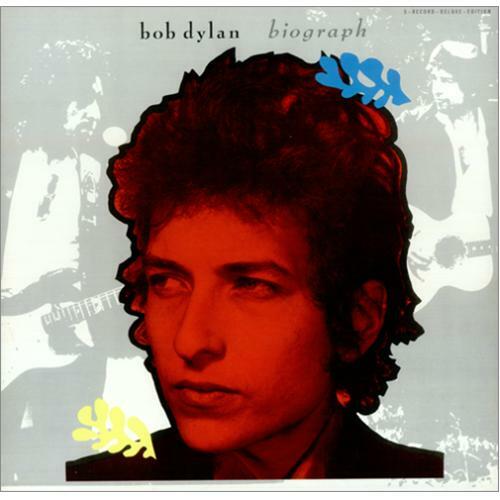 Listening through Biograph today for the first time in a long while, what strikes me most of all is how much this project is drawn from the same impulse to write down the “truth” about Bob Dylan and to work out which are the great tracks (released, unreleased, live versions). What is annoying me right now is how much better Biograph is than this little blog project. Let me say this straight: Biograph is the best Bob Dylan album. Yes, that’s unfair. It’s five albums. It’s heavily curated. It uses dozens of short-cuts and cheats. But if you are going to have one Bob Dylan album, it should be Biograph. It doesn’t have all of his best material, but it is so very close that nothing else is even close. What is most remarkable, having spent almost half a year listening to nothing but Dylan, is how incredibly well this thing is put together. Not just the selection of live tracks – which is superlative – but the organization of the material. The jumping around in time might not work were it not done so incredibly well. Songs are put in dialogue with each other (to use an annoying art world term) in ways that allow you to hear them afresh. This is basically ten sides of Dylan, some of them repeating. Because that’s who Dylan is. Side One: Dylan love songs jumps from the late-1960s back to the beginnings, going from “Lay Lady Lay” to “Baby, Let Me Follow You Down” (the lone song from his first album). The highlight is the unreleased version of “I’ll Keep It With Mine”, which is a remarkable piano performance of a beautiful song. Side Two: Dylan as protest singer. Four of the songs are from two albums (Times and Freewheelin’), indicating just how short the protest period was (basically not more than two years). Four anthems: “The Times They Are a-Changin’”, “Blowin’ in the Wind”, “Masters of War”, “Hattie Carroll” and then the unreleased “Percy’s Song”, one of the staples of his early concerts. The greatest of the greatest hits collection. Side Three: Going rock. Two songs from Highway 61 Revisited (“Rolling Stone”, obviously, and “Tombstone Blues”), plus a live version of a song from Blonde on Blonde (“Most Likely You Go Your Way” from Before the Flood). Three pieces of genius in here though: the addition of “Mixed-Up Confusion” Dylan’s first single (quickly pulled by his label), which demonstrates that his rock inclinations were there in 1962 and not a later addition. Historicize! 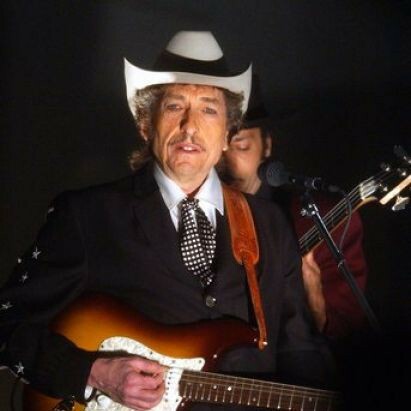 Second, “Groom’s Still Waiting at the Altar”, the B-side non-album song from Shot of Love, which sounds completely at home after “Tombstone Blues” – Dylan doesn’t change that much in fifteen years. Finally, “Jet Pilot”, a tiny little goof of a song that I used to fill the remaining space on mix-tapes for years and years. Side Four: Continues the mid-1960s by bringing in the rock tour. “Subterranean Homesick Blues” is the anchor here, leading into two live songs from his fateful 1966 tour of the UK (“I Don’t Believe You” from Belfast; “Visions of Johanna” from London – very little he has ever done is better than this version of this song), and then an incredible segue into “Every Grain of Sand”, which sounds so, so, so right after “Visions of Johanna”. Dylan’s text on the latter, by the way, is very telling – he certainly was not post-Christian when he did that interview with Crowe! Side Five: Surreal Dylan. “Tambourine Man”, “Million Dollar Bash”, “Quinn the Eskimo”. For a long time this was my least favourite side of Dylan, and probably my least favourite side of Biograph. This is the one I’ve listened to the least, in all honesty. Side Six: Heartbreak Dylan. This may be the one I’ve listened to the most. Anchored by “Tangled Up in Blue”, this side has three unreleased tracks: “You’re a Big Girl Now”, “Abandoned Love” and an incredible “It’s All Over Now, Baby Blue” (Manchester 1966 – the third song from the space of about ten days on that magical 1966 tour). The three mid-1970s tracks really shape the earlier songs (including “To Ramona”) that open and close the side. Best side on the album. Side Seven: Rarities. Another incredible side. Two non-album singles (“Can You Please Crawl Out You Window?” and “Positively 4th Street”) followed by a live version of “Isis” from the Montreal Rolling Thunder show in 1975 (an incredible version) and outtakes from Shot of Love and Blood on the Tracks. This album just keeps picking up steam! Side Eight: Dylan wants you, baby! Six songs of lust and desire going right back to an unreleased 1962 version of “Baby, I’m in the Mood for You” and a 1965 version of “I Wanna Be Your Lover”. “I Want You”, “Heart of Mine” (better than the album version) and “Just Like a Woman”. You get the picture. Seductive Dylan. Side Nine: Exotic Dylan meets Religious Dylan. A live version of “Romance in Durango” from the Rolling Thunder Revue (also the Montreal show) and “Señor”, followed by “Gotta Serve Somebody” and “I Believe in You”, both from Slow Train Coming, before a flashback to New Morning for “Time Passes Slowly”. This is a bit of a misstep right at the end. The religious material probably should have been paired with some of the earlier spiritual material from, say, John Wesley Harding. Side Ten: The rousing finale. All five songs here have been regularly performed by Dylan in his encores. Crowd pleasers! Jam songs! Bring out the guest stars and do a duet on “I Shall be Released”, “Knockin’ on Heaven’s Door”, “All Along the Watchtower”, “Solid Rock” and “Forever Young”. If that doesn’t leave them wanting more I don’t know what will! Listening to this album again today has been a bit bizarre. I haven’t been moving backward this year at all. Once I pass a week it is gone from the rotation. This means that there are songs that I’ve heard dozens (hundreds) of times, but they’re generally new versions. I hadn’t heard the album version of “Like A Rolling Stone” since January, but I’ve heard it on bootlegs almost every week that’s he’s had a tour. So much of the 1960s material sounds so strange now. Dylan’s early-1960s voice is gone – I’m used to the mid-1980s version. It’s like being in a pot on the stove – you don’t notice the gradual change in temperature until you step right out. I love Biograph. I’ve owned three copies of this album. The one that I got for Christmas in 1985 disappeared somewhere along the way. I obviously loaned it to someone (I even suspect that I know who, but it is a high school friend that I haven’t seen in a quarter century – he’s not on Facebook, so how can I ask for it back?). It’s long gone. Sometime in the 1990s while I was in grad school I bought it again on CD at a used record store and I can remember listening to it a few times when I lived in Montreal. We sold all of our CDs a few years ago, however, after burning the ones we wanted to keep. So I have MP3s of that version. A few weeks ago I bought a third copy at a used record store here in Calgary after searching unsuccessfully for the text of the two booklets online. I wanted to be able to read the incredible liner notes, which is how I’ve spent this morning – listening again to the album that made me a short-lived Dylan fan while reading the liner notes just as I did on Christmas Day twenty-nine years ago.